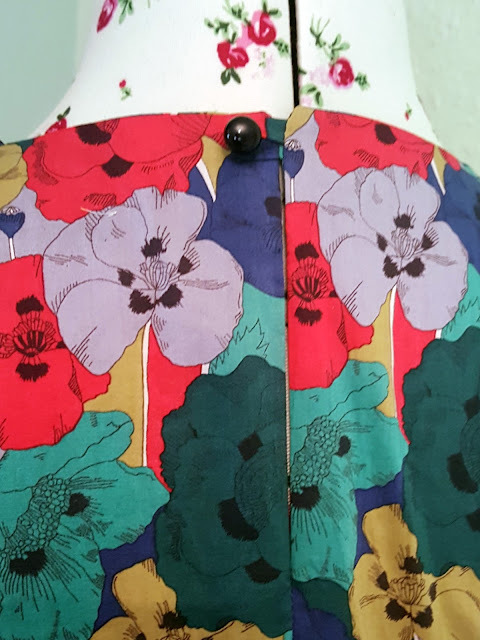 Apparently the last time I showed you an item of clothing I made was some time in April! 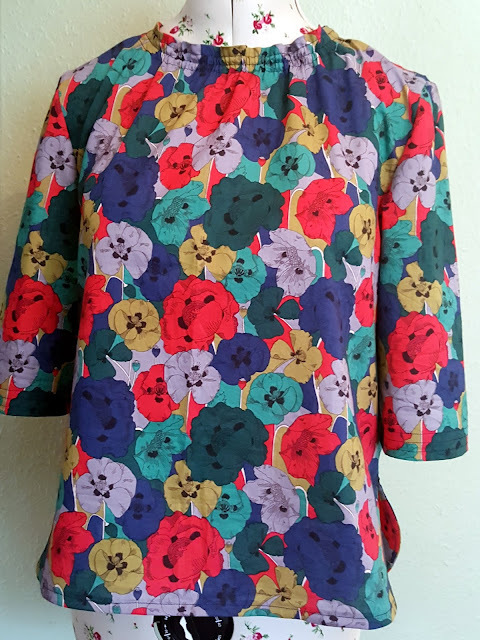 I have been making clothing since then, but it's either been stuff I haven't been that fussed about - making things just for the sake of making things - or I haven't got round to taking photographs. Our house is quite dark and it's hard to find decent locations around it to take modelled photographs, but I can just about find a suitable location for my tailors dummy (Rosie) to model things for me. I bought the pattern for this top (it also includes a dress variation as well) the day it was released. I saw it on Instagram I think, and instantly fell in love with it. I needed some new tops that weren't simple jersey t-shirts and haven't been that keen on shirts or button front tops. 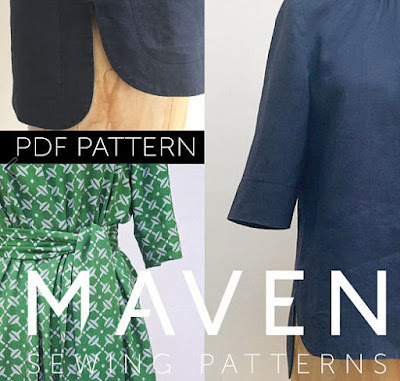 The Rochester top by Maven Patterns seemed to be the very thing I was looking for. 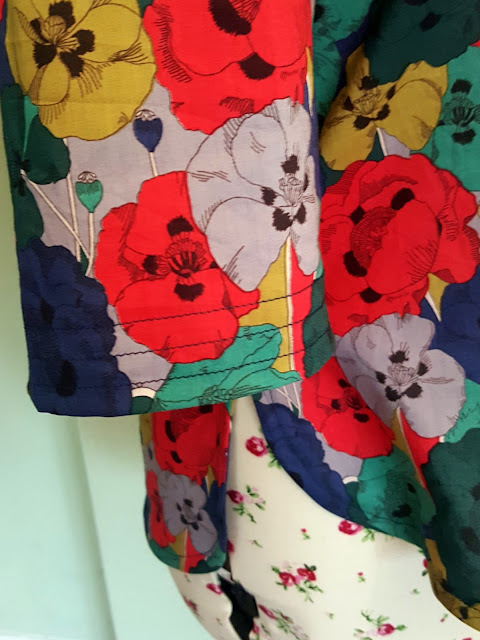 I must admit I was also slightly swayed by the gorgeous green fabric the sample was made up in - but I love my versions even though they're not in that fabric! I say "versions" because I've made two. The first was from some chambray I had in my stash, which I made almost immediately I'd purchased the pattern. I made a size 14;it fits me well with the exception of the sleeves being a smidge tight. It's wearable, but I find they tend to ride up my biceps and get stuck there as I move, I have to keep tugging them down. 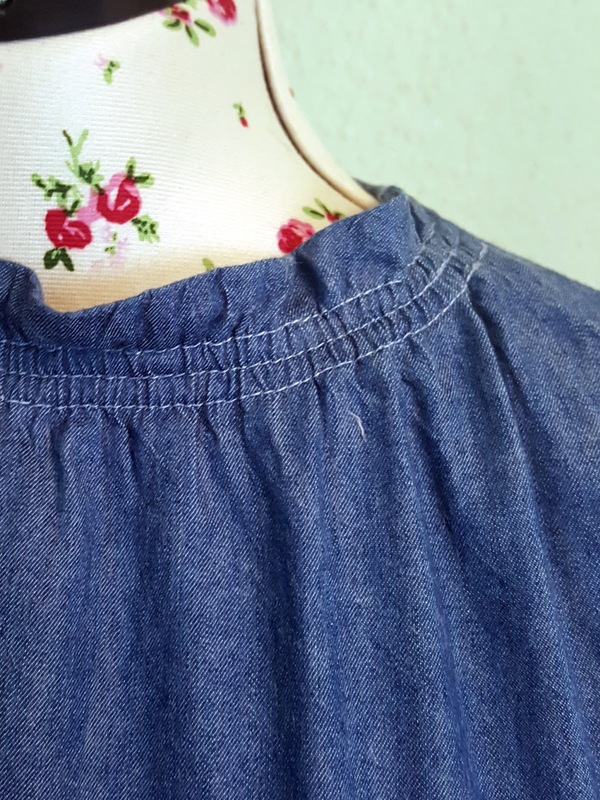 I keep meaning to go back and take a slightly narrower seam on the sleeve to counteract this, but the seam allowance is only 1cm so I don't have huge amounts to play with. This was my first time using a Maven Patterns pattern and I really enjoyed the experience. The pdf fitted together nicely and it came with two sets of instructions - a full, detailed set and another which was more of a basic outline of the steps. I used a combination of the two - the outline steps for most of it, but I referred to the full instructions for the hem facing. 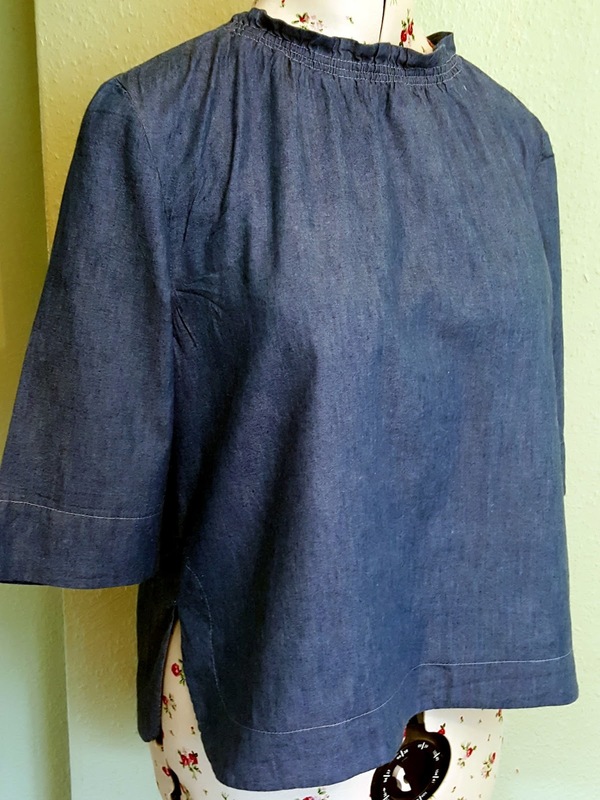 I made a couple of changes; the pattern includes a deep pleat at the back which I originally cut in my chambray but it stuck out quite a bit when I tried it on, so I went back and took it out, by sewing down the centre back below the pleat stitching at the top. I also used two narrow pieces of elastic to gather the neck, rather than one wider piece as the pattern suggests. I found that the wider piece didn't lay very flat. Other than that I made my first version as per the pattern. You get a template included for the topstitching for the hem facing, which I pinned onto the top and followed around with my machine foot. 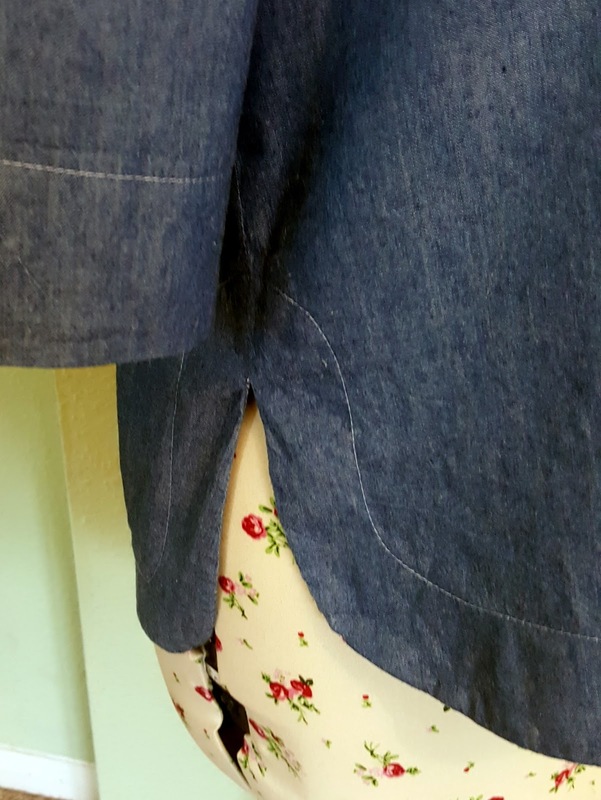 This worked out really well and I think looks nice in a contrast thread against the chambray. This weekend just gone I went on a sewing day with some friends and needed a project to take along, so I cut out another Rochester top, this time from a small piece of (I think) Liberty cotton. I had one metre to play with and just squeezed the top out. I had to use bias strips to finish the hem rather than the hem bands, but managed to get everything out. This time I cut the sleeves slightly wider - adding about 3/4 of an inch I think in total - and they feel a lot more comfortable. I also decided to add an opening to the back neck, with a little button and loop. I can get the chambray one on and off without an opening, but it's a little tight. With this version I echoed the three lines of stitching around the neck for the elastic casing on the sleeve hems. I think it's quite a nice touch. At some stage I'd like to make the dress, I'm just on the look out for the right fabric now! The liberty one Is really beautiful! Thank you! I'm particularly pleased that I managed to squeeze it out of 1 metre of fabric. I like both tops! I like the brightness of the floral print top! I may have to try this pattern. Thank you Linda. It's a great pattern - I hope you like it if you try it.